The Hotel Primula lies in Campitello di Fassa, that is well-known tourist resort of the Trentino Dolomites in Val di Fassa. 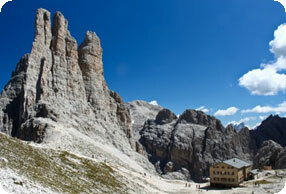 The Dolomites has been inscribed in the list of the Unesco World Heritage. Dolomites Unesco World Nature Heritage. You can reach us very easily and follow carefully the enclosed maps and our directions. Brenner A22 motorway exit EGNA-ORA, road signs to Cavalese -> Val di Fiemme (Main Road Nr. 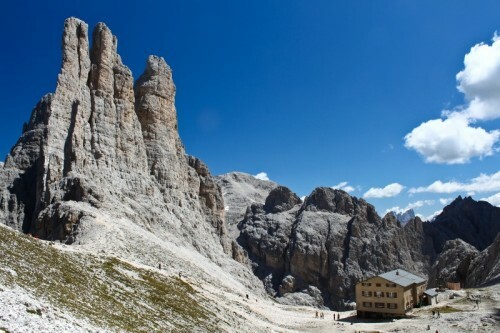 48 of the Dolomites). Drive on to Cavalese -> Predazzo -> Moena (Val di Fassa) -> Campitello di Fassa (Canazei). NB - If you come from the Brenner: A22 exit Bolzano Nord -> Passo Costalunga -> Vigo di Fassa -> Campitello di Fassa (Canazei). The hotel lies about 100 m after the centre on the left side. -> Moena -> Campitello di Fassa. Summer and winter connections from the main cities of central/northern Italy. Daily connections from Trento, Ora and Bolzano.